Ever since I can remember I have loved animatronics. Even the cheesy ones. Even as a kid, I loved them for the combination of machine, art, and life. I used to love to go to Chuck E. Cheese and Showbiz Pizza. I was a child that would actually sit there and watch those animatronic shows and not run into the game room. Even to this day, I love them. I rode the mount everest ride at Animal Kingdom, even though roller coasters make me sick, just to see the incredible animatronic yeti that is there. That thing was cool, and afterwards, I literally had to lay down I was so sick. That thing goes backwards in the dark. Not something somebody like me should be riding. My first animatronic creature I built, that I can remember and actually classifies as one, would be the piano player I made. I was going to build a band like Showbiz Pizza had, but in miniature. I got as far as the piano player. It was made out of popsicle sticks. The body was anchored on a shoe box, and the arms were hinged to the body. I had a little DC motor inside that I had glued a piece of popsicle stick to. When the motor spun, it hit the arm sticks and it made the piano player play. Funny thing. I can remember the only paint I had was black and red, and that’s what I painted the cardboard piano I made. I remember thinking that it looked satanic. It looked like something from some campy satanic Hammer film movie. Maybe that’s why the others never got made. I was also in elementary school. The first real one I attempted was when I was old enough to be on my own, but not old enough to get into bars and drink. I had an old Tandy COlor COmputer 3 from my childhood that I actually used. I build a dinosaur type creature. The movements were his head left and right, and up and down, his tail left and right, and his eyes blinked. It was pretty funny. I built the framework out of pvc pipe and connections. The movements were done by gear motors. They were turned on by a pulse counting circuit board I invented myself. The pulses came out from the serial port that I would turn on and off with POKEs. That’s a piece of code you only used if you knew what you were doing. I used the potentiometer joystick inputs geared to the motors so the computer would know where the movements were at. I built the entire thing and made it work, but I never got around to putting skin on it. It was always a pvc frame of a dinosaur that moved, and blinked. Good times. My next adventure in animatronics was in my twenties when I lived in Hollywood. I had my little shop set up in the garage and I was learning how to braze steel. What should I make? Of course, I decided on something animatronic. It was actually an automaton in my opinion. Since it wasn’t programmable, it did the same thing over and over, but whatever. It was steel rods welded together. Very basic, but I wanted the arms to be more than just planks lifting up and down. So I hinged the elbows and ran a push rod that made them bend when the arms went up. 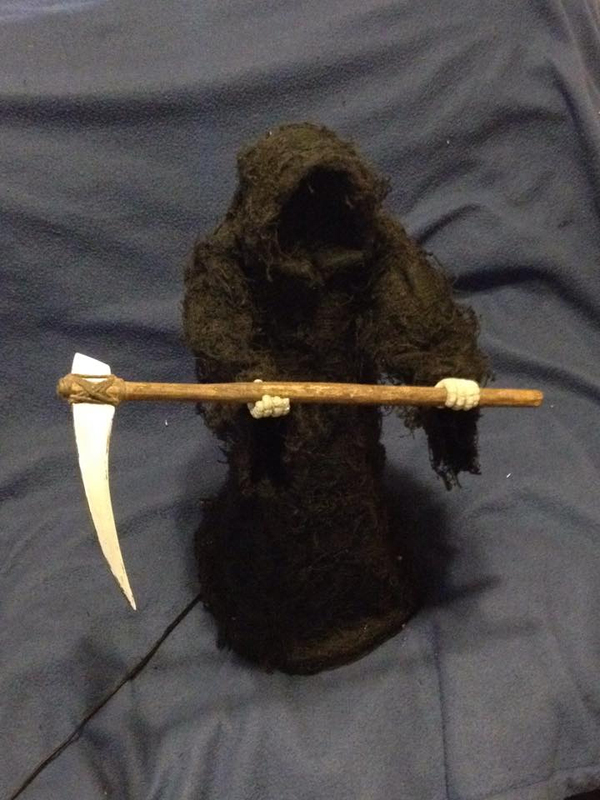 I turned it into the grim reaper. When I moved from Hollywood, it ended up in a shed for almost twenty years. I just recently pulled it out and fixed it up. Works better than ever now. The next time I decided to build an animatronic creature, I wanted to do it right. I wanted to do it the way Disney pioneered. Not the fancy stuff they have today, but their original technology. It uses DTMF tones. What are those? You have heard them many times. They are the tones on your phone. It stands for Dual Tone Multi Frequency. There are actually sixteen of them. You have your ‘0’ through ‘9’, and you have your ‘*’ and your ‘#’, but there is also ‘A,B,C, and D’. There is a chip made to detect these tones, and you can buy circuits ready to go that use them. Each tone gets tied to a movement. Then you can record the tones that make up the movements and play them repeatedly. Since the tones are all on one track, you can put that track on the left side, and you can put the audio for the creature on the right side. The tones and audio can be a mp3, CD, tape, it doesn’t matter, because all of the movements get controlled by sound. 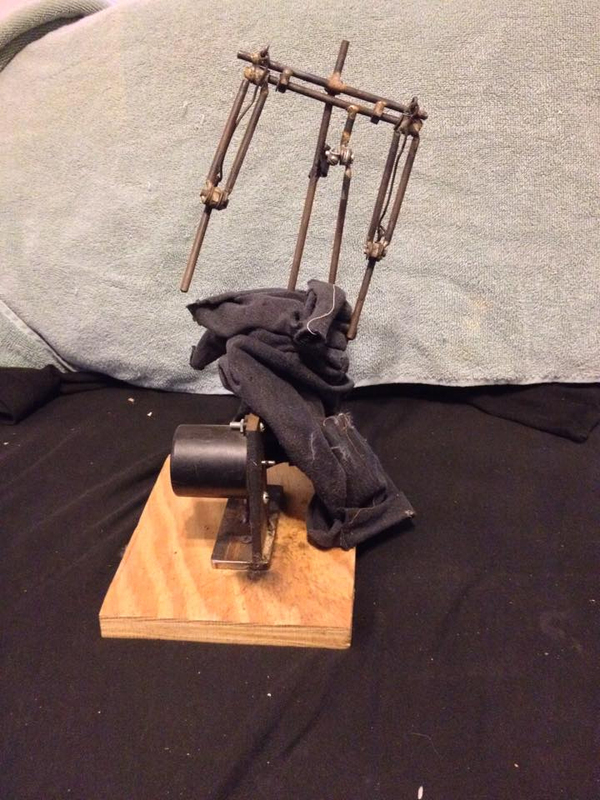 I built an animatronic frog. It used four servos. One for the eyes. One for the mouth. One to tilt the head left and right, and one to move the head up and down. Three of the servos are all inside of the frogs head. I gave each one three different positions. The eyes, left, right and center. The mouth fully open, a little open, and closed, and each head movement is broken up the same way. I first built the control circuit out of a Basic Stamp 2 and used the Rainbow DTMF Electronic kit. The DTMF circuit would send signals to the Basic Stamp and the stamp would move the servos accordingly. It worked great, but it did have one flaw that bugged me. It was very linear. The Basic Stamp uses a step by step basic language, so it could only do one movement at a time. A tone would signal a movement, and you had to wait until that movement was over before you could signal the next one. It was really limiting. I never thought about it while I was building it. That’s kind of why I never did anything with it. From there it got sat on a shelf and never touched. Until recently. Since I pulled my grim reaper out and fixed it up, I might as well fix up the frog. So I decided to redo the electronics. This time, instead of one big chip, I have four smaller chips, one to control each servo. This way they can work independently and each movement doesn’t have to wait. This time I used PicAxe chips, which I have become accustomed to. I still used the same DTMF circuit. I also fixed some broken parts. To program the movements, I have found that the best way is to use Acid Loop Base editor. It’s usually a program that you can use music loops to make songs. If you just load each DTMF tone in the tracks, then you can draw in on the timeline which tones to play. 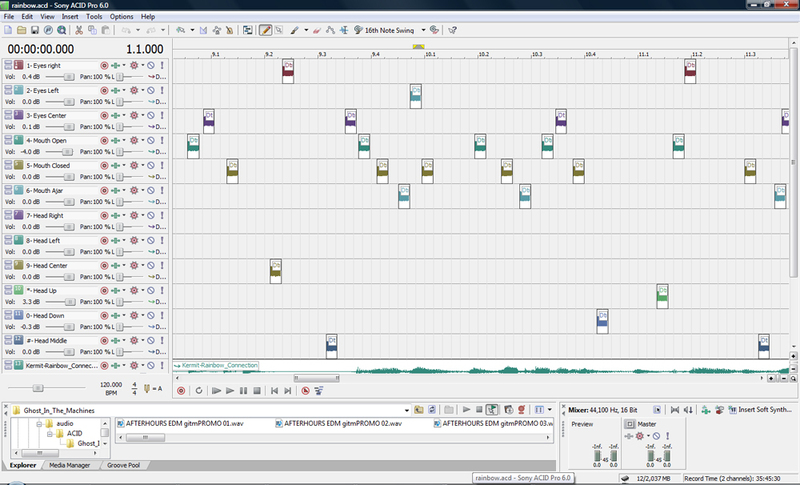 You can bring in the audio track and have it in the timeline and export it as a single music file with the audio on the left side and the tones on the right side. Then you can play the music file from anything. I named my frog Bill. His name is Bill Frog. I still don’t know what to do with him except just play with it. You would think there would be something I can use him for. If I had a whole bunch more of them, I could open an amazing restaurant. Next Article Teleportation – or – Pop Haydn is cool.